My family recently hosted a visit from one of my daughter’s college friends. I’ll refer to her as “Whitney” because her name happens to be Whitney. 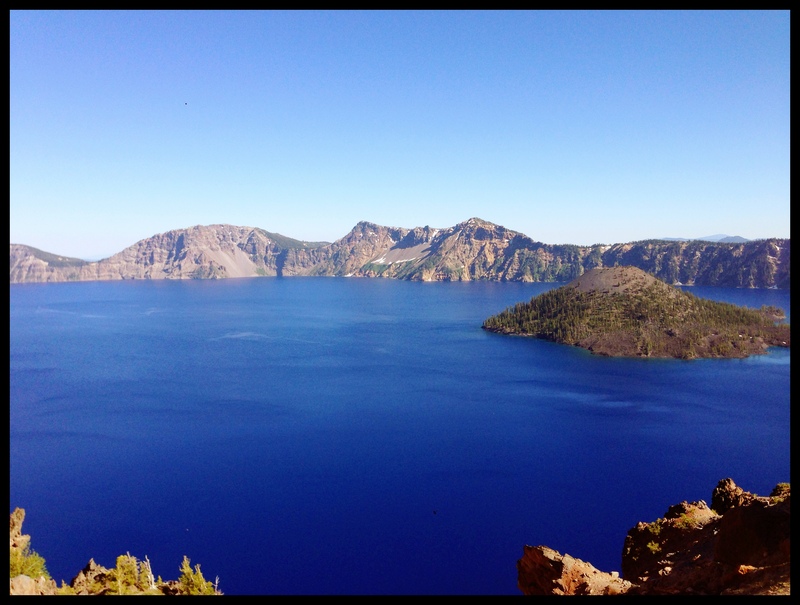 My daughter wanted to take her friend to visit Crater Lake National Park, but this posed a problem – Crater Lake is about three hours from our home, and it is difficult to drive and sleep at the same time. In order to obtain proper rest prior to her arrival at the lake, my daughter ingeniously invited the rest of our family along. This allowed me to enjoy driving the 145 miles over winding mountainous roads while she fell into a coma in the back seat. Crater Lake is to Oregon as the Statue of Liberty is to New York. State law strictly forbids any local resident to visit these attractions unaccompanied by an out-of-state visitor. Whitney is from Tulsa. When we arrived at the entrance, we announced that we had an out-of-state visitor, and after the park ranger inspected her identification, he let us enter. The most important thing to remember about any national park is that it is a safe haven for wildlife. Even for ferocious species such as mountain lions, black bears, wolverines and, of course, bees. I know this because at our first stop when we got out of the car to gaze across the serene vista of crystal blue water, all of a sudden, and completely without notice, Whitney began waving her arms in a helicopter fashion and running off in a zigzag pattern, which, of course, is the international signal for Bee Attack. It turned out that it wasn’t so much of an actual Bee Attack as it was an actual bee sighting. You nature lovers will be relieved to learn that this wild and majestic bee was not harmed in any way, and in fact, had only gotten within about 75 feet of Whitney when she sprung into the required defensive action. It was following this first stop that we made a critical mistake. One that almost cost us our lives – we failed to turn around and leave immediately. Due to this err, we naively continued on. Not because we wanted to, but because eons of genetic human evolution required us to venture forward to the nucleus of this natural wonder. The technical term for this “nucleus” is The Gift Shop. Rim Drive consists of almost a full 1 ¾ traffic lanes. At numerous points, it’s difficult to ignore the fact that not only does the road lack any shoulder, it also lacks a guardrail to prevent your vehicle from plunging over a 1000 feet sheer vertical drop-off. And not only does the road lack a shoulder, at places, there is actually a “negative shoulder” (i.e. it lacks even a full fog line to mark the beginning of your final decent to certain death). I would prefer to run in a zigzag pattern from a mountain lion than face this ribbon of asphalt ever again. But it was all worth it, because we arrived safely at Rim Village, where we immediately visited the Rim Gift Shop. While the vista across the lake was awe inspiring, it did not compare to the panorama inside the gift shop: Garage sale items as far as the eye could see. 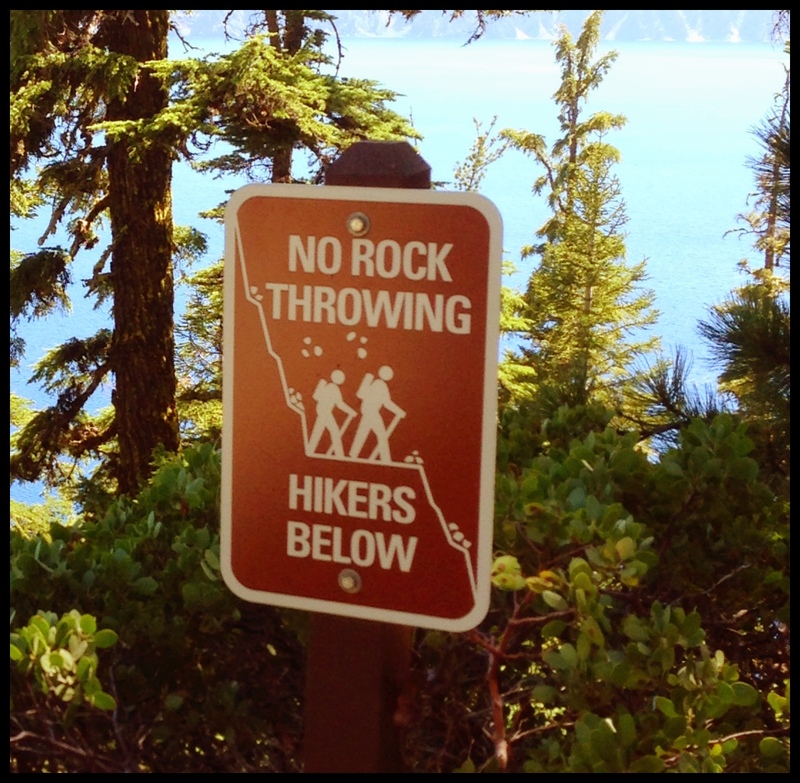 Luckily, our entire hiking party survived the harrowing vertical trek without ever being struck by a rock thrown from above, or giving in to our more base instincts and throwing one ourselves. Most importantly, my daughter arrived home from the trip satisfied of accomplishing her goal of showing Whitney Crater Lake, and most importantly, refreshed from her final three hour nap. What??? No photo of the gift shop???? It’s best left to your imagination.